Showing 1 - 20 of 598 results. A PDF copy of four postcards created in collaboration with New Zealand Red Cross. 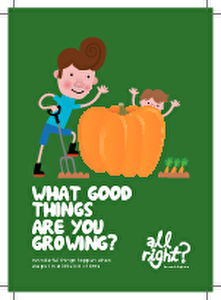 The front of each postcard is an image depicting one of the Five Ways to Wellbeing. On the reverse is list of six wellbeing tips by Dr Rob Gordon and the contact details for the Canterbury Support Line. A photograph of four preschool children and an adult playing drums. 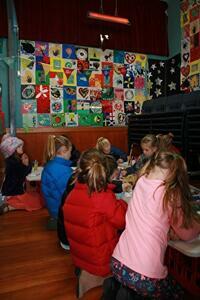 The photograph was taken at the Tiny Adventures launch at Niu Early Learning Centre in Linwood. 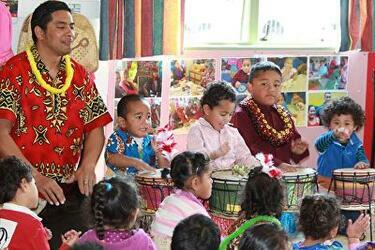 Niu Early Learning Centre is managed by the Tongan Canterbury Community Trust. The Tiny Adventure card packs and smartphone app offer ideas, games and quick fun ways for parents to spend time with their children. They are a project of the All Right? mental health campaign. 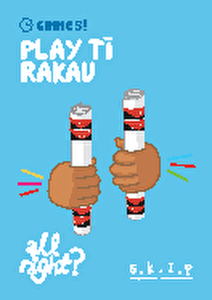 A PDF copy of five Tiny Adventures cards that incorporate Maori culture and language. Created in partnership with SKIP, Tiny Adventures helped parents to spend quality time with their children by suggesting some simple activities. The cards were available in packs and free to download from www.allright.or.nz/adventures. A PDF document containing ideas from the public for All Right? 's Tiny Adventures Share Activities. People were invited to email All Right? with ideas for fun activities for young children. A PDF copy of a document detailing a ten-step 'recipe' for the All Right? campaign. 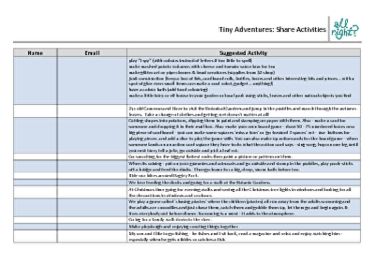 The document provides a framework for the implementation of similar campaigns by different groups and in different contexts, while including information about the background and implementation of the All Right? campaign itself. A PDF copy of a sign design from All Right? 's 'Take a Breather' campaign. The design features a plethora of everyday images, including traffic, roadworks, work and leisure activities. Images from phase 2 of the All Right? campaign and Christmas-themed images are also included. 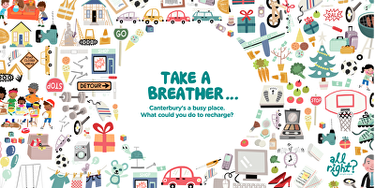 In the centre are the words, "Take a breather... Canterbury's a busy place. What could you do to recharge?". 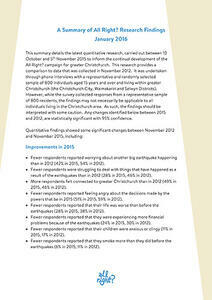 A PDF copy of a summary report of All Right? research findings. The report was created in January 2016. A photograph of a flag in a road cone, next to a digger carrying out road works. The flag is part of the first phase of All Right? 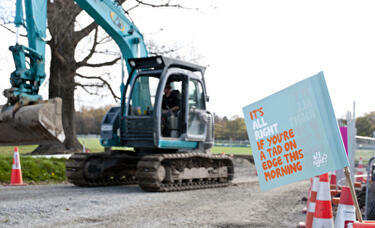 's advertising campaign, and reads, "It's all right if you're a tad on edge this morning". 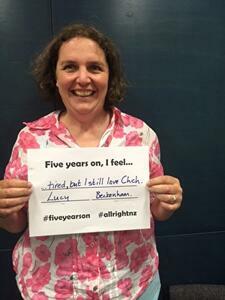 A photograph of Dr Lucy D'Aeth, Public Health Specialist for All Right?, taking part in #FiveYearsOn. Lucy holds a sign which reads, "Five years on, I feel... ...tired, but I still love Chch. Lucy Beckenham." All Right? posted the photograph on their Facebook Timeline on 21 February 2016 at 9:12am. All Right? captioned the photograph. 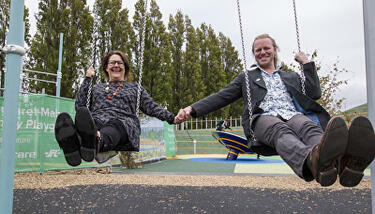 "Lucy from Healthy Christchurch is feeling tired, but she still loves Chch!! 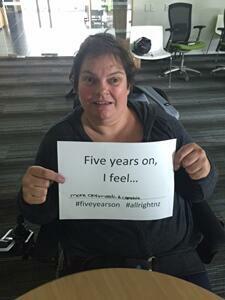 #fiveyears on #5yearson #allrightnz". An image used as an ANZAC day profile picture on the All Right? Facebook page. 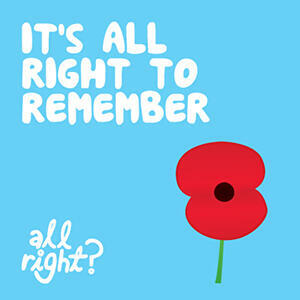 The image reads, "It's all right to remember." All Right? posted the image on their Facebook page on 24 April 2014 at 6:42pm. 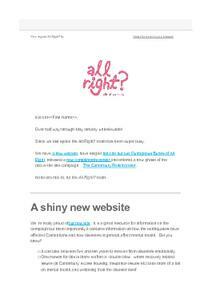 A PDF copy of a newsletter sent by All Right? to their mailing list in May 2014. 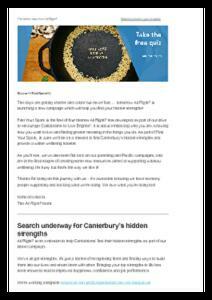 A PDF copy of a newsletter sent by All Right? to their mailing list in May 2016. 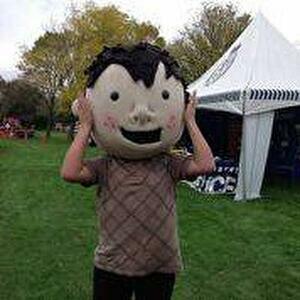 A photograph of a festival-goer wearing an 'All Rightie' head. 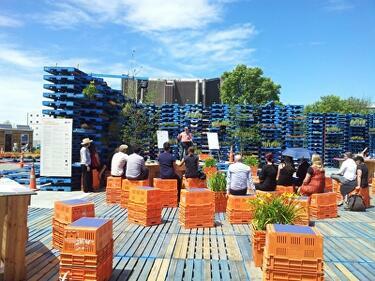 The photograph was taken at the Summerz End Youth Festival 2014. All Right? 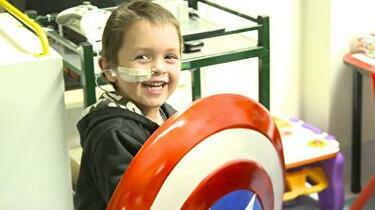 posted the photograph on their Facebook page on 7 April 2014 at 6.22pm. 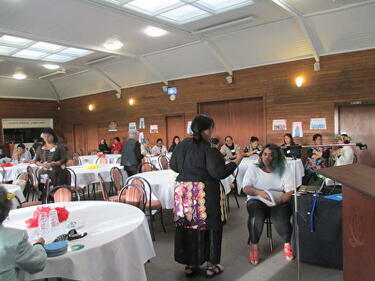 A photograph of conference participants at the second annual Out of the Heart Pacific Women's Leadership Conference, held at Riccarton Racecourse on 21 May 2016. The conference was sponsored by All Right? and featured posters from the All Right? I am ... Identity project.